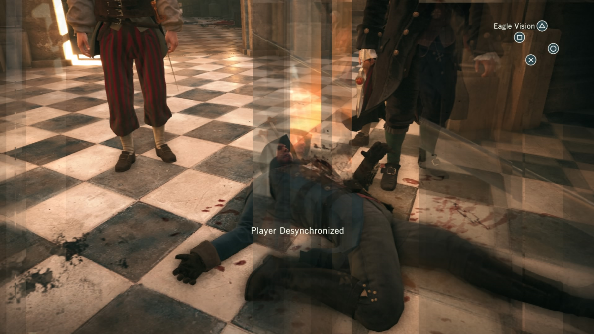 Adventures in… Assassin’s Creed: Unity – Butcher, or Benny Hill? Balanced on a wire drawn taut between two of Notre Dame’s supporting pillars, I survey the congregation below. Among them lies my target; a chubby guy in a hat whose name I’ve long forgotten because this Assassins vs Templar war nonsense is getting tedious now. All I know is that his neck needs to be profusely bleeding, and I’m happy to oblige. I drop from my perch, collide into a barrier that was meters away from where I should have fallen, and collapse in a heap at the feet of my target. Thirty exclamation marks start swinging around on my HUD, the ‘dong’ sound effect signalling that I’ve been discovered rings out repeatedly. Before I can gather myself together I’ve been surrounded by guards who don’t hang around before skewering me like a hog roast. Colours fade, my assassin collapses, and the memory desyncs. This is my third attempt. Since when did Ubisoft make murder this obtuse? The game resets and I’m back outside the cathedral again. The climbing in Unity is lovely and fluid but I’ve scaled this exact route up Notre Dame’s spiny exterior more times than I’m happy with in the last half an hour. I break in again, tip-toe past the organ player, and reach my vantage point once more. Eagle vision turns my target into a glowing gold statue, and also highlights the absurd amount of guards that surround him. Being on this wire isn’t going to do me any favours – I’m wearing a big flappy blue coat and look like a parrot perched up here – so I drop down into the masses and try to use the crowd to mask my approach. The distance to my target is obscured by an eagle vision hangover. 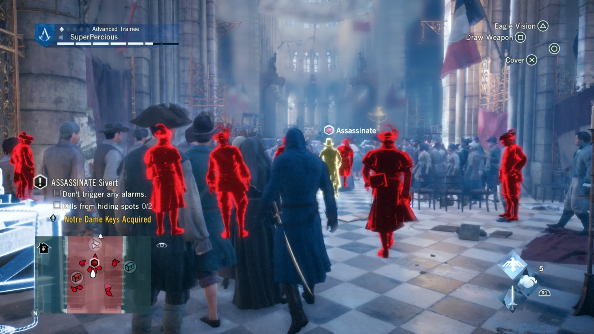 With the feature turned off, the guards are still highlighted in red, their shapes layered over the crowd and making it impossible to see straight. A massive circle has also spread out from my feet covering half the screen in blue mist. I’m not even sure what that’s supposed to be telling me. Nevertheless, I finally get into what I assume is ‘position’, and drop into a crouch. Sneaking forward, I wait for the HUD to prompt that I can use the hidden blade. Nothing appears, so I nudge forward a little more. And a little more. Just two more steps. The prompt never comes. I bump into my target, who yells for guards because apparently, a small man nuzzling you in the bottom during a church service counts as “suspicious”. I try to grab him but he’s already scarpered, and all I’m left with is those angry guards again, determined to puncture me with France’s finest steel. 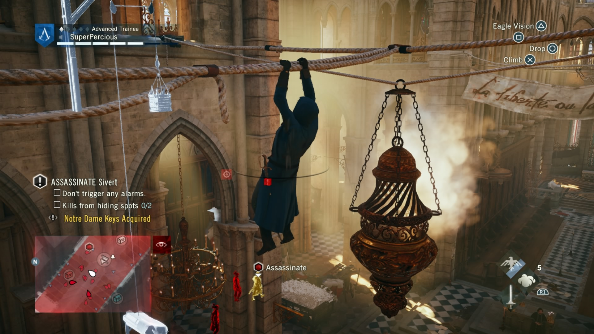 Clearly Assassin’s Creed’s stealth just wasn’t working. My next attempt sees me run full-pelt into the crowd, hurl a smoke bomb at the team of guards, and try to take down the target during the confusion. 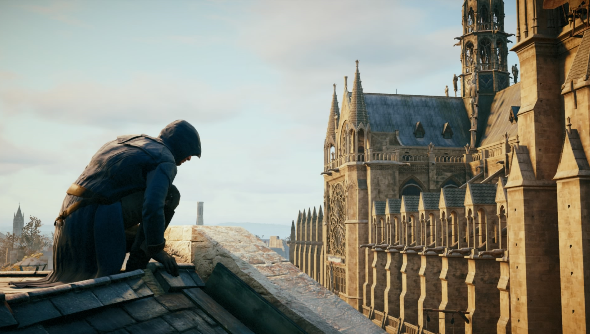 Unfortunately Unity’s Arno isn’t Sam Fisher, and doesn’t come equipped with thermal goggles. Eagle vision should be the replacement, but in Unity it’s now on a cooldown. I run out of vision too quickly, can’t reactivate it, lose my target in the smoke, and practically walk onto a guard’s drawn blade. With a freshly respawned body I swing back into Notre Dame and spend a good few minutes looking at every HUD symbol. There is so much on screen that until you sit and analyse every tiny little blip you really don’t have enough information on what’s possible. On this sixth attempt I finally notice a green dot above the cathedral’s confession booth. A few leaps from the chandeliers puts me above it, and I slip inside. The target’s path changes, making a beeline for the booth. He pulls back the curtain, steps inside, and is greeted by my fist punching through the wooden panelling and thrusting a length of sharpened steel deep into his fat neck. I think the message of this story is: if you’re looking for a contract killer who can guarantee results on the first attempt, please look elsewhere for your business. I can provide results, but only after I’ve botched the job half-a-dozen times, blamed the tools I’ve been provided with, cursed, spat at the ground, and broken my own legs in a clumsy fall. If an entertaining bloodbath is what you’re after though, please look me up in the Yellow Pages.